Gets into the midst of a cheering crowd. 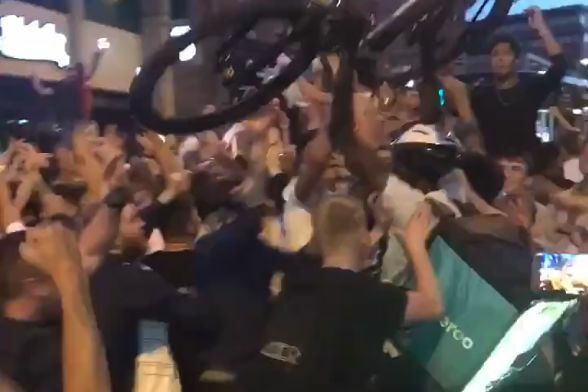 One delivery man from popular takeaway service Deliveroo joined the celebrations on the streets of England after their incredible penalty-shootout win against Colombia on Tuesday night. People joined together in delight after seeing the country progress from the Round of 16 following a nail-biting finale. Throwing himself into the midst of a cheering crowd singing “Football’s Coming Home”, the man was welcomed into the group as he held his bicycle aloft.